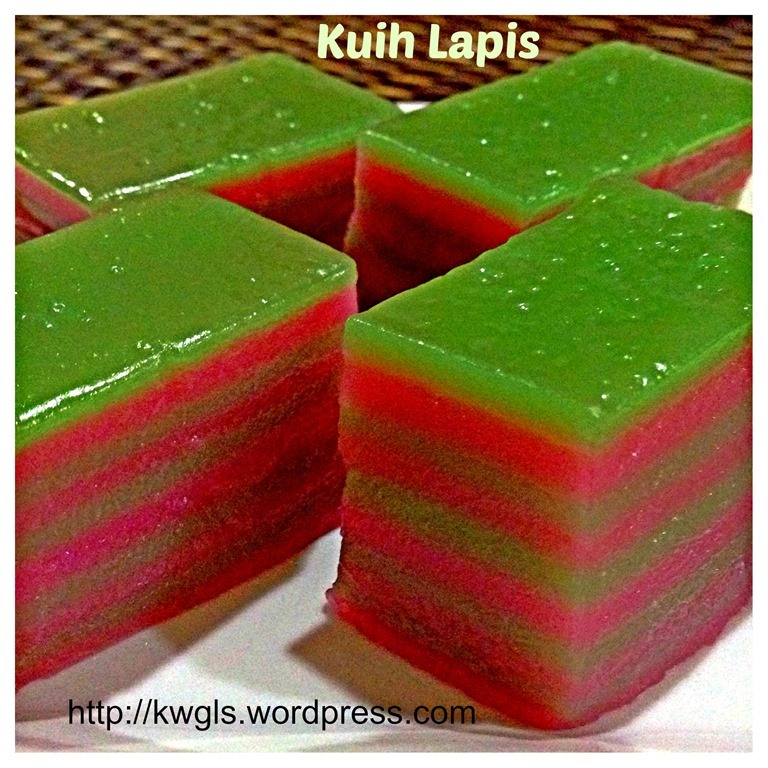 Lapis is in Malay and is literally translated as “layers’. This is a Nonya steamed cake and is different from the Kek lapis. 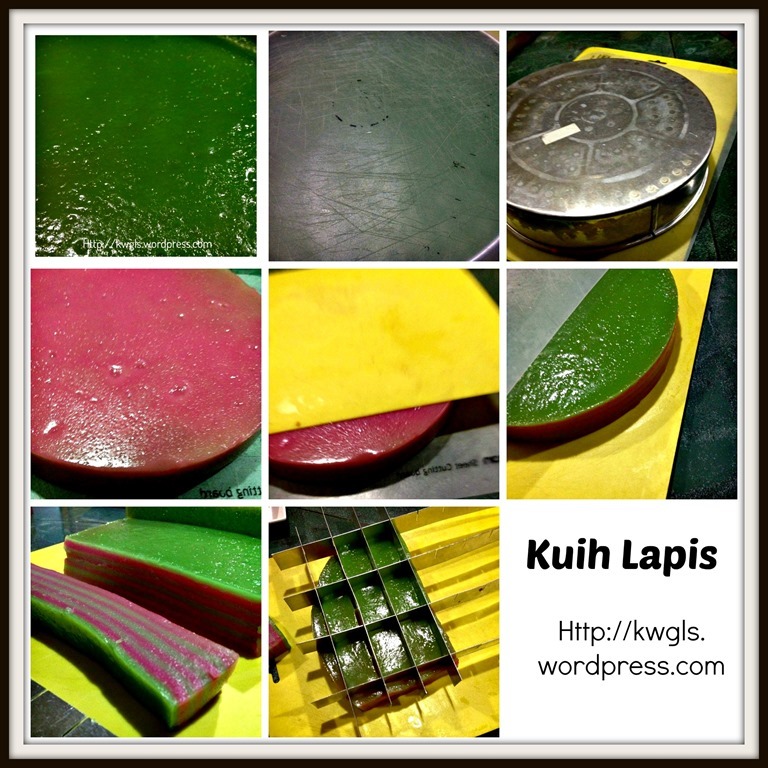 Kek lapis is baked but kueh lapis is steamed and the ingredients are very different. 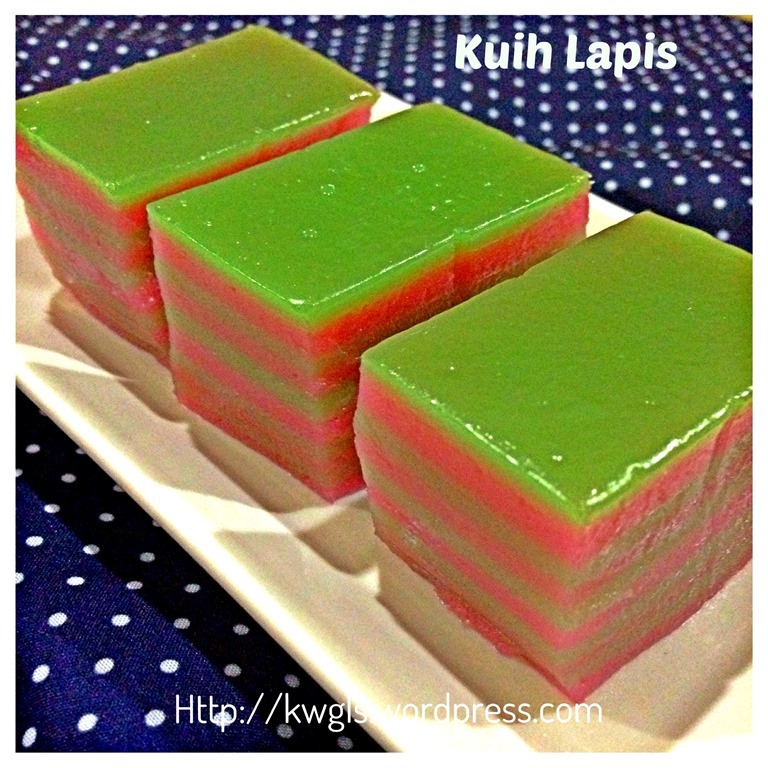 Where the main ingredients of Kek Lapis (layered cakes) are butter, wheat flours, eggs and sugar, the main ingredients of kueh lapis (steamed layered cakes) are rice flours, starches and water. For my international readers, Baba-Nonya are terms used for the descendants of late 15th and 16th-century Chinese immigrants to the Indonesian archipelago and British Malaya (now Peninsular Malaysia and Singapore). They are also called Peranakan and their cuisines are characterized by the influences of Malay and Chinese cuisines. Most of the Chinese influenced cuisines have incorporated local produces such as coconut milk, screw pine leaves, or even spices. In fact, when I was in Fujian province, People’s Republic of China, they are selling these steamed rice cakes but the colour are yellow and without the use of coconut milk and Pandanus leaves. This steamed layered cake is not perfect. I am not happy with the colour as it is rather dull. When I was adding the permitted food colouring, my wife kept telling me, “not so much, not so much”.. I heed her advise and this is the colour combination… Well, her intention definitely cannot be doubted, she just want to avoid using food colouring which I think a lot of readers will concur with me. Other than this colouring imperfection, I would say this recipe is a rather good recipe from another of my famous blogger friends, Ann Low of Anncco Journal. I have long wanted to prepare this steamed cake, but I have never really take a step out to prepare it. After so many Western pastries that I baked recently for Christmas, I suddenly felt the urge to have some Asian cakes that my mom usually prepared for us. What came into my mind is Kueh Lapis or Layered steamed cake or Gao Teng Kueh in Chinese. 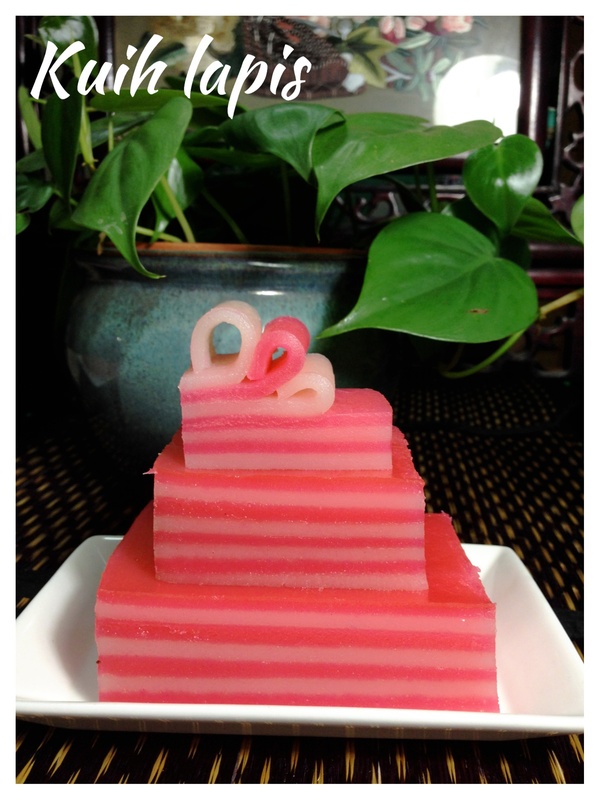 When I goggled for the recipe, Google direct me to her post :Kueh Lapis that she prepared early of the year. When I looked at her beautiful images and list of ingredients, I decided immediately to use her recipe. As I do not have any Pandanus Leaves with me, I have decided to take the shortcut using ready made Pandanus Paste. Therefore, I have used green and red as my version. I have also used the 9” round traditional type of aluminium tin to steam the kueh because the tin fits perfectly in my steamer. The steamed layered cake is very springy, the right texture for me. I especially loved the coconut milk aroma in the kueh. Ann had reduced the sugar but I have increased the sugar slightly and for a sweet tooth like me, I would still prefer it a bit sweeter. There is no doubt about the springiness. I can even tear between layers and if my late mom saw this, she will definitely scolded us for playing with food! Well, in recent years, apparently one of the test to a good steamed layered cake is whether or not it can be tore into layers and springy enough and “not sticking to the teeth”. To my surprise, the ingredients that my moms previously used and those stated in this recipe is rather different. In olden days, most of the flour used are rice flours but the recent recipes that I saw are mostly starches such as sago flour or tapioca flour. Now, I knew why my mom’s kueh Lapis cannot be tore apart between layers because her rice flour used are too much. * If you like less springy or softer kuih lapis, please increase the rice flour portion by 50 grams and reduce the tapioca flour portion by 50 grams. Put some water in the steamer and bring to boil. Lightly grease the tin and heat in the steamer for at least 5 minutes. Shift the tapioca and rice flours to a big bowl. Add in sugar. Stir well and make a well. Add in water and coconut milk. 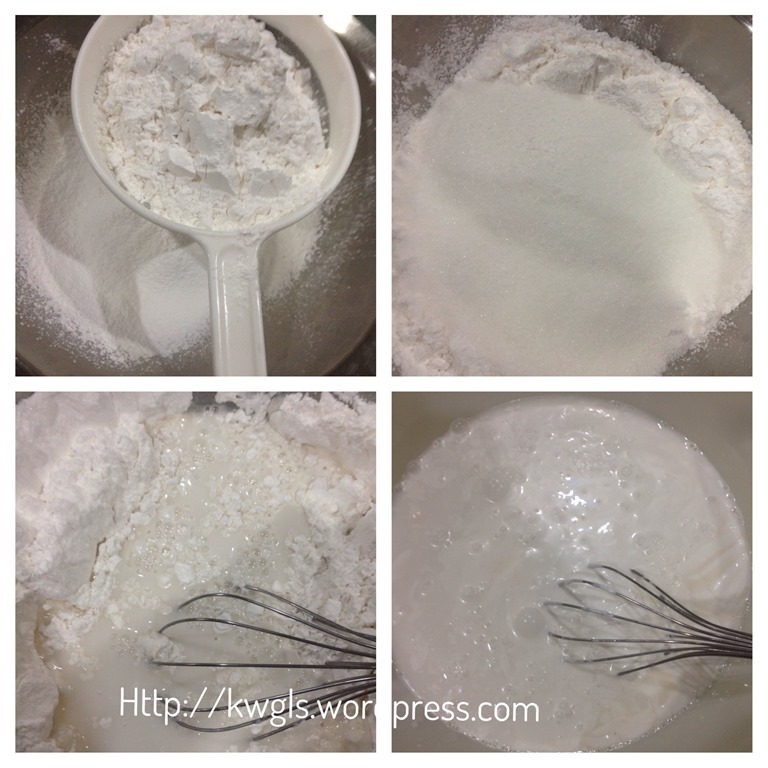 Use a balloon whisk to stir until well mixed and sugar are dissolved. Sift the flour solution into another bowl. Divide into 2 equal portion. For one portion, add in Pandanus paste (or Pandanus juice) and for the other portion, add in some red permitted food colouring. Stir until well mix. Get ready 2 ladles of same size and assign one each to the green and red flour solution. (note: If you use Pandanus juice, the colour may not be green enough and rather light resembling white colour). Lightly grease your preferred container and put the empty greased tin in the steamer. Let it steams for at least 5 minutes. Open the lid of the steamer. put 1-1.5 ladles of green/red flour solution in the tin. 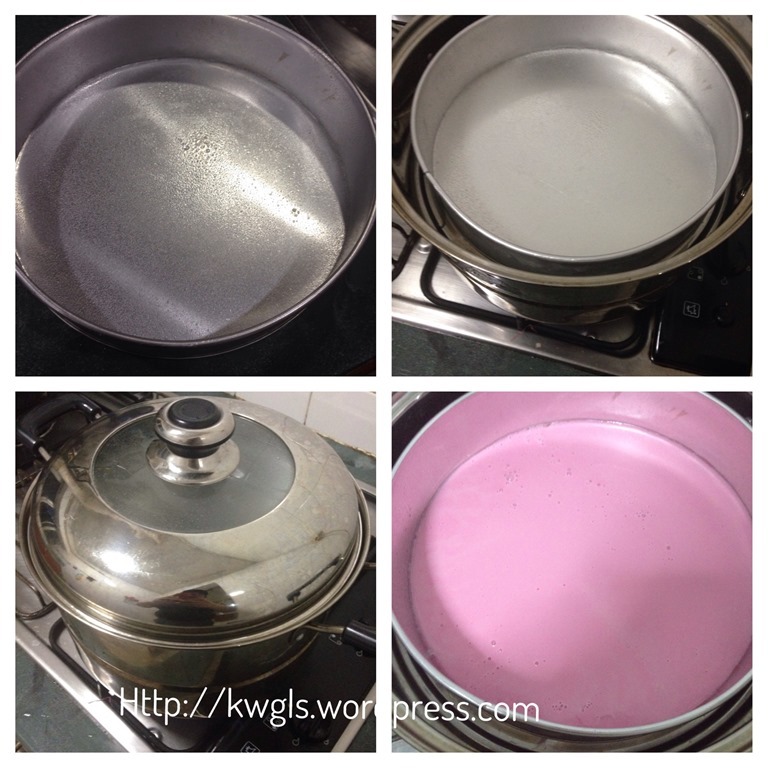 Cover the lid and steams for 5 minutes. Open the lid and have another layer or red/green flour solution. Steams for another 5 minutes. Repeat the same procedure until all the green and red flour solution have finished. In the final layer, steamed the whole cake for 15 minutes to 20 minutes until the cake looks transparent. Rest for at least 1-2 hours before transferring for cutting. I have left my steamed cake overnight before I cut it. To cut the cake, get ready two baking papers or two clean chopping boards. Cover the top with one baking paper or chopping board (colourless chopping board). Turn the cake over and put another chopping board (yellow chopping board) on the base of the cake. Turn over again and take away the first chopping board (colourless chopping board) or baking paper. (In this illustration, the cake had “sat” on top of the yellow chopping board). Lightly grease a “sharp knife”. Cut the cake in one knife. Don’t saw the cake as the edge will not be smooth. Alternatively, you can use the cake cutter to press down the steamed cake for more even cake size. Best served at room temperature as snack or breakfast item. The making of kueh lapis is much easier than what I thought. This recipe of Ann uses less rice flour make it easier to cut. The whole cake is very springy. There are still some imperfections for this cake as traditionally, it should be 9 layers with the first layer being red in colour. I have counted wrongly and resulted my cake have 8 layers and first layer is green in colour. For my overseas readers who missed this cake, hope this illustration will help to ease your homesickness. Take a step out to prepare this.. Hope you like the post today. Cheers and have a nice day. 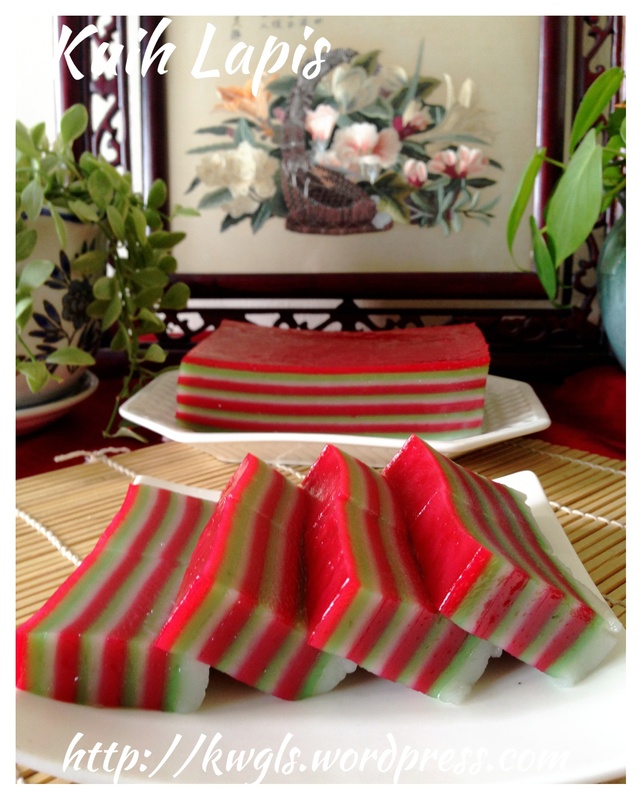 This entry was posted in Chinese and Asian Cakes and Snacks, Food Preparation Series and tagged GUAI SHU SHU, Guaishushu, kenneth goh, kueh lapis, kuih lapis, Nonya steamed lapis, Nonya steamed layered cake, postaday. Bookmark the permalink. I have never heard of steamed cake…how interesting! And I think the color is lovely and plenty colorful! Wow! So pretty! I’m impressed! Very pretty! I love that you always give a history lesson with your recipes. It’s always fascinating! That looks so interesting. Thanks for the super detailed directions too. Thanks very much for the recipe..i made it last nite and it was very nice. finally I am able to make this kueh. 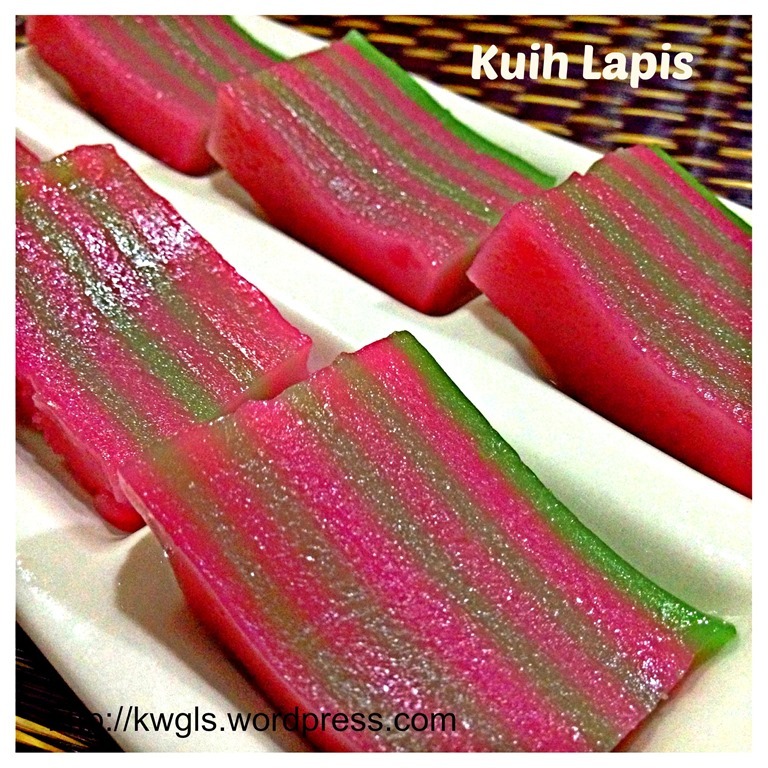 Hi Kenneth, finally got to making this Kuih Lapis. It was really delicious and love the part where the layers can be peeled of one by one. I cheated a bit by using the pandan juice for the whole batter and just add some red colouring for the other half. One thing though how do u shake the kuih out of the pan, mine was really tough to remove maybe setting time not long enough? My girl beh tahan kept asking for some. Wow so nice! 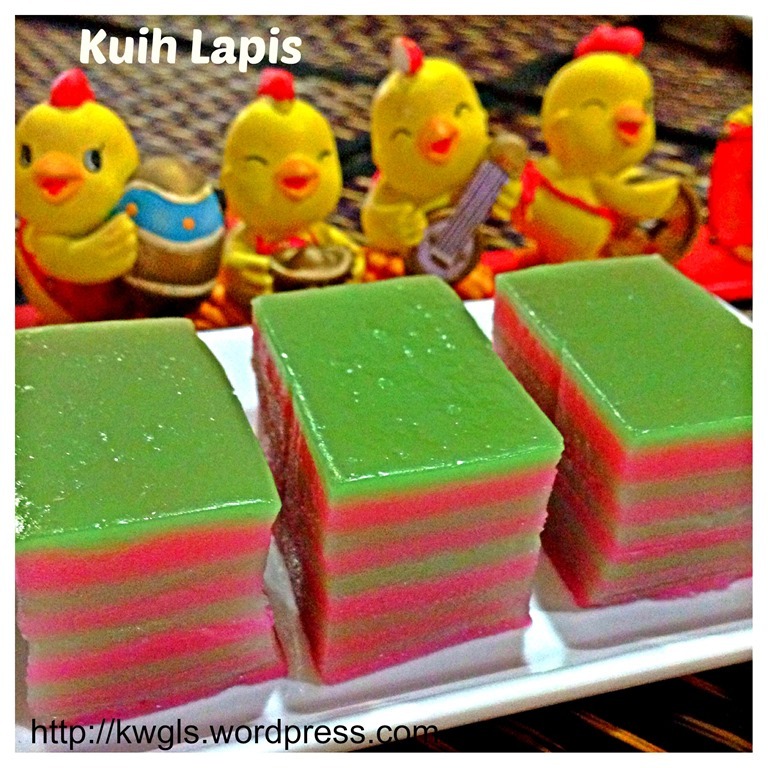 My girl loves this kuih, must do this for sure. Can this keep in fridge for few days? any coconut milk kuih best consumed in the day it is prepared. The most is two days. Yes, you can. just a bit more layer or thicker layer. 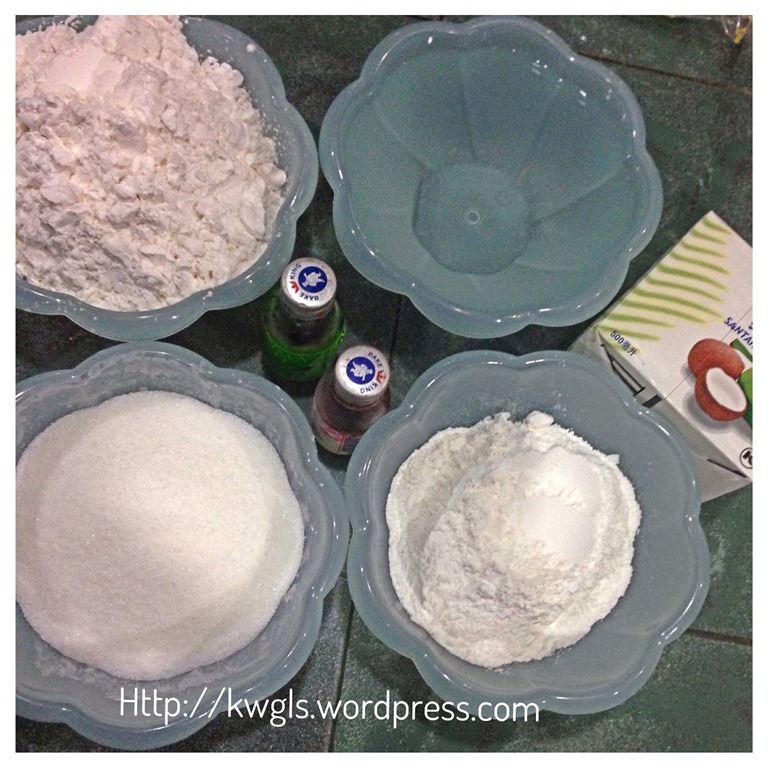 Hi Kenneth, can part of the water required be substituted with coconut milk to increase the fragrance of the kueh? Thanks, Kenneth. I’m glad I found a recipe for this. I’ve tasted this kind of dessert long time ago when I went to Bangkok, Thailand and never remembered the name of it. It was also made in just 2 colors, dark green and light green and it tasted like pandan flavor. May I know the reason for heating up the baking pan for 5 minutes? I’ll try to buy the ingredients and hopefully make this soon. Don’t put it in the fridge, it goes hard. 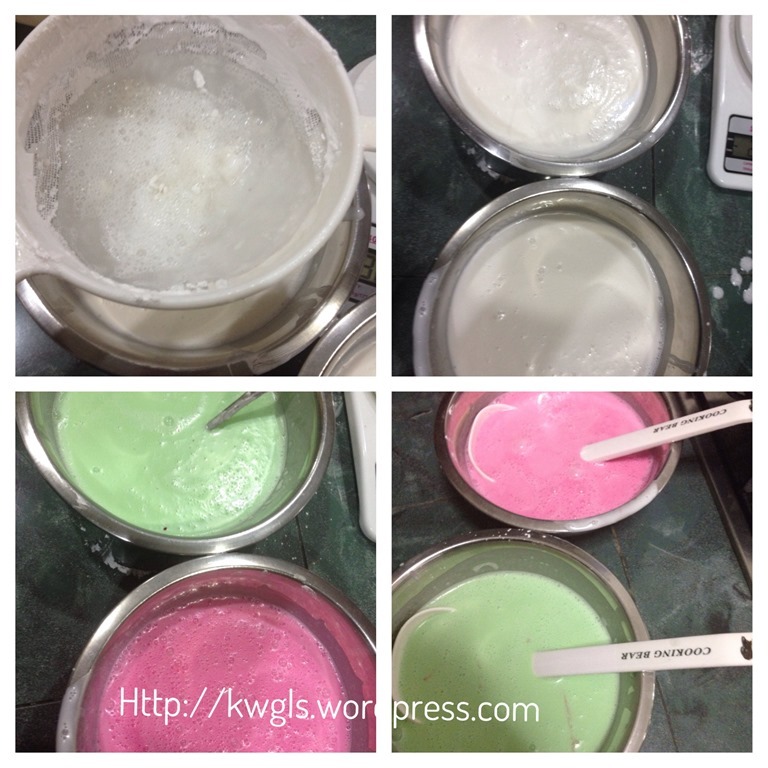 I use whatever colours I lay my hand on first and pandan essence. So good. Seems like mine is hard to cook in the centre. Kinda warp in the centre.. How to make it flat and nice? I believed it is your steamer heat circulation problem. Apparently, your heat circulation in the steamer is not good. In the case, I would advsie you to use a smaller mould for the cake. You can try make individual cupcake size kuih lapis using say egg tarts mould. where can i get a copy of your easy mooncake recipe book? which bookstore can i buy from.